A truly unique design concept, so typical of Nannini. This all black option is just superb. The Nannini Hot Rod goggles have a really modern compact style, which continues the eyewear concept of fold flat compact glasses. They fold neatly in half and fit inside a pocket for easy storage. The face mask is made from the finest real leather which is expertly stitched to a double lined grilamid frame creating a crush proof structure. The elasticated headband has a rubber seam on the inside to create a non slip fit when worn over motorcycle crash helmets. It connects to the goggle frame with a fork design that helps the goggles fit tightly to the face. The tinted grey polycarbonate lenses have a scratch resistant and an anti fog coating and are designed to offer maximum visibility. They are UV protected and offer total protection against UVA and UVB rays. 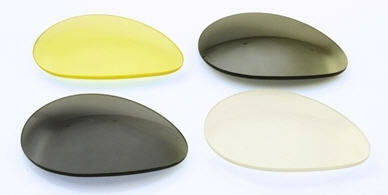 Don't forget we also offer replacement lens options.